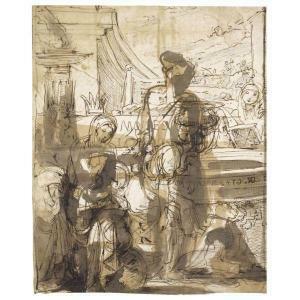 Find artworks, auction results, sale prices and pictures of Fortunato Duranti at auctions worldwide. 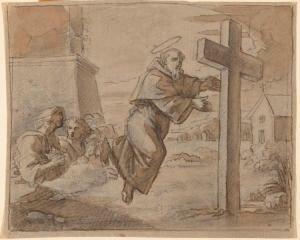 Description: DURANTI, FORTUNATO (1787 Montefortino 1863) Monk in floating rapture before a cross. 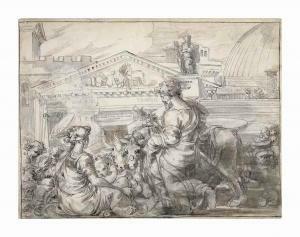 Black chalk, pen and brush and grey-brown ink, on laid paper with grey wash. 16.9 x 20.4 cm. --------------- DURANTI, FORTUNATO (1787 Montefortino 1863) Mönch in schwebender Verzückung vor einem Kreuz. Schwarze Kreide, Feder und Pinsel in Graubraun, auf grau laviertem Bütten. 16,9 x 20,4 cm. This sheet illustrates the Holy Family or possibly The Nativity set in a highly heterodox context: the background is covered with a sequence of classical monuments, the main one bearing above the portal the inscription 'tibi dabbo [sic] claves vestri regni celorum' (I will give you the keys of the kingdom of heaven), echoing Christ\’\’\’\’\’\’\’\’s words to Saint Peter, who appears as a statue on top of the adjacent monumental staircase. Duranti\’\’\’\’\’\’\’\’s idiosyncratic style reaches a new high in this monumental sheet, possibly executed during his first Roman stay (1807-1815), as recorded in this personal interpretation of classical antiquity. 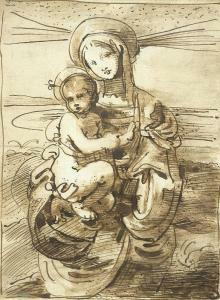 Madonna mit Jesusknaben. Verso: Studie zu einer thronende Madonna mit stehendem Jesusknaben, zu Füssen eine Schlange. The Virgin and Child. 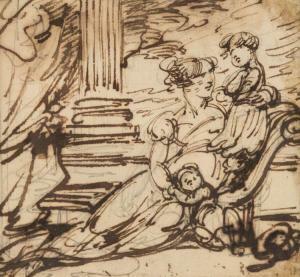 Verso: A study of the Virgin Enthroned with standing infant Christ, a serpent underfoot. Pen and brush and brown ink. 30 x 22 cm. In antique frame.